The Scottish Vocational Qualification (SVQ 2) in Food and Drink Operations (Fish and Shellfish Processing Skills) at SCQF level 5 develops the skills and the knowledge required when working with fish and shellfish. It enables individuals to be more proficient in food safety standards and in maintaining the workplace. 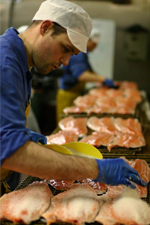 Optional Units offer the opportunity to tailor the qualification to suit business needs, for example: fish and shellfish units include filleting, processing, grading, packing and the retail display of fish and shellfish, while more generic units include counter/take-away food service and sales. There are also additional principles units covering product knowledge, frying fish and chips, smoking, quality assessment and seafood sales. Developed by Improve Ltd (changed to NSAFD (National Skills Food and Drink Academy)), the sector skills council for the food and drink manufacturing sector, the SVQ in Food and Drink Operations qualification is awarded in partnership with SQA and NSAFD, SQA and SFMTA (Scottish Federation of Meat Traders Association) or SQA and Scottish Bakers. It is available through employers and training providers. This SVQ must be assessed in the workplace, so is only suitable for individuals employed in the onshore sectors of the fish and shellfish industry. The SVQ 2 in Food and Drink Operations (Fish and Shellfish Processing Skills) at SCQF level 5 is a new qualification for the growing food and drink manufacture sector. It has been developed as a result of a review of the National Occupational Standards. Candidates can progress to a range of courses — allowing centres to retain or build student numbers. For example, candidates could progress to a higher level with SVQ 3 Food and Drink Operations at SCQF level 6. Alternatively, they could progress laterally to SVQ 2 in Food and Drink Operations: Food Manufacturing Excellence at SCQF level 5. Assessment of this award will be through a series of theoretical and practical assessments or tasks. Some assessments will be carried out under supervised open-book conditions, others under supervised closed-book conditions. The assessment strategy does not allow for workplace simulation. The assessment strategy does not allow for workplace simulation. The assessment requirements are detailed in Improve’s Assessment Strategy 2013 and SQA’s Assessment Guidance for this award. GG52 22 in Food and Drink Operations (Fish and Shellfish Processing Skills) is jointly awarded by NSAFD.